Silk really is my main go-to fabric in summer. It’s just too damn hot in Texas for anything heavier! As I demonstrated here in chilly Paris, this OTTE dress is a perfect transitional piece because it works with fall layers like leather jackets and boots, but works just as well worn lightly in summer with just some fun, colorful accessories. Definitely a comfy but chic look for summertime. Also, how killer are these BaubleBar earrings? I’ve been wearing them non-stop since they arrived in my mailbox. PS – you still have a few days to enter the Kayu Design giveaway to win this adorable polka-dot clutch! Just enter using the Rafflecopter widget below and be sure to tell your friends! LOVE this dress on you, especially paired with these shoes! 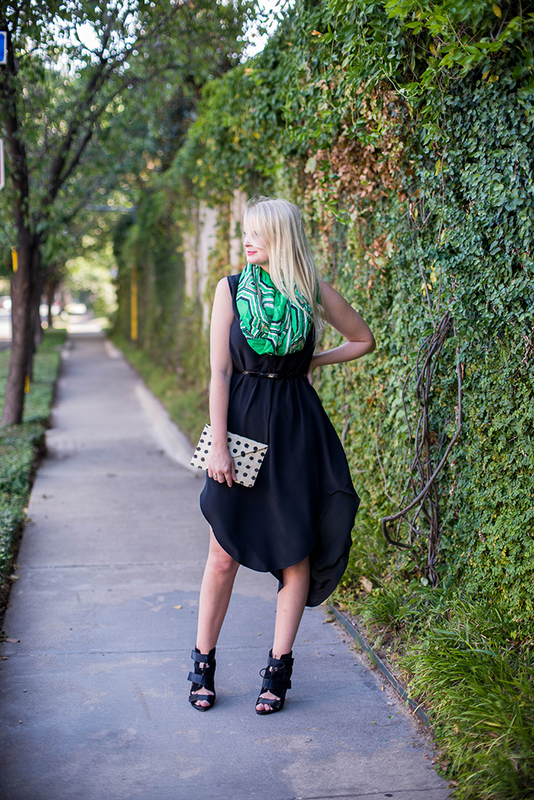 Love how the scarf adds a pop of color to these black pieces…and those shoes are ah-mazing!! That dress and scarf is so pretty on you, but your SHOES! Killer!!!! your mixing of prints is so fun and I love that polka dot clutch – great giveaway! what a fox! You look amaze in that Otte dress! These pieces together are gorgeous! LOVE those shoes! So cute! I love the scarf and that bag is so cute! Your dress has such fabulous movement! You look beautiful! I love this dress and I love how you styled the entire outfit! I love this outfit on you! You look so long and lean. Love this outfit! 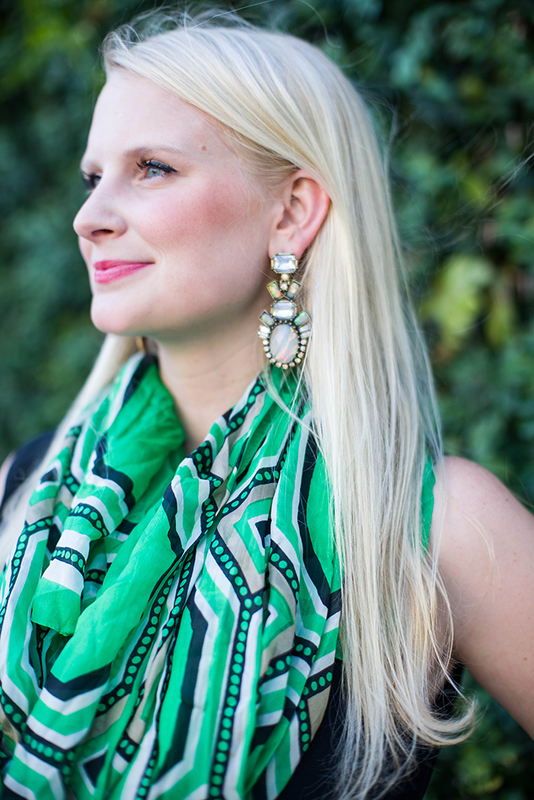 The pop of color with the scarf is genius! Love this outfit! And the scarf as a pop of color is genius! This is darling! Adore the scarf and clutch! Emerald is one of my favorite shades for fall–it’s so gorgeous and feels very rich! I love the hemline of this dress, very pretty! Love those shoes!!! Truly go great with the dress! When will you announce the winner of the clutch? It’s been a month. Hi Lana – thanks for reaching out! The winner was emailed. I only announce the name if the winner wants to be promoted. Thanks!